Brandi Mize is the 15th recipient of the Lawrence E. Scheving Award, established in 2004 to recognize the first-year medical student with the highest grade in Human Structure. Feb. 16, 2018 | Feb. 16, 2018 | A new name now graces the Lawrence E. Scheving Award plaque outside the Division of Clinical Anatomy’s office on the ground floor of the Daniel W. Rahn Interprofessional Education Building. 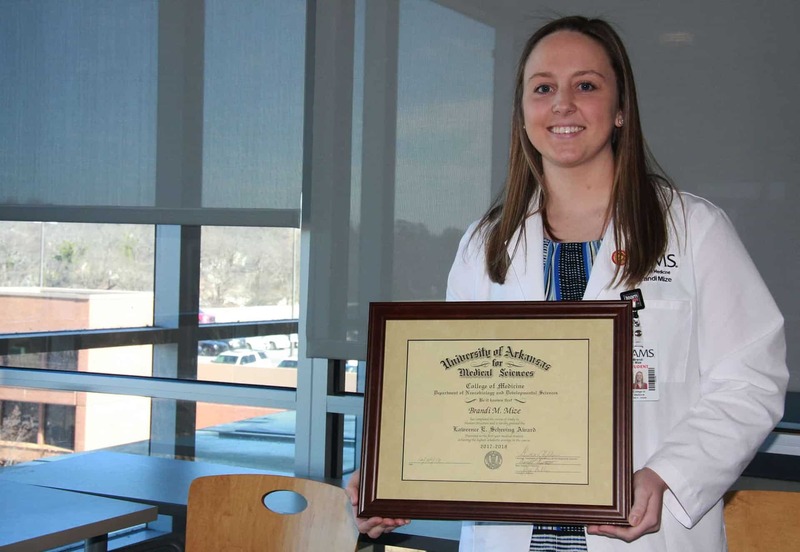 Brandi M. Mize of Paragould accepted the award, given to the first-year medical student with the highest grade in Human Structure, Feb. 12 from David Davies, Ph.D., associate professor in the UAMS College of Medicine’s Department of Neurobiology and Developmental Sciences. Mize is the 15th recipient of the award, handed out annually since 2004 to the student who displays the best grasp on a course that includes gross anatomy and aspects of radiology, histology and surgery. The Scheving Award was established on behalf of the late Lawrence E. Scheving, Ph.D., the first Rebsamen professor of anatomical science. He served as director of the gross anatomy course for 15 years and was a UAMS College of Medicine faculty member for 20 years until his retirement in 1990. Mize learned of her selection for the award in December in an email a few days after her final exam. “It’s a proud moment for me and a happy surprise,” she said. Mize has had an interest in medicine since at least middle school. Her first recollection is an assignment by a science teacher to pick out current activities associated with topics learned in class. Eventually, she realized hers always had to do with medicine. “It started there and blossomed through high school and college,” said Mize. She graduated from Arkansas State University with a double major in biology and chemistry. Mize is still deciding what specialty she’ll practice, but she’s fairly certain she wants to be a surgeon so she can have a “hands-on” occupation. Growing up, she said it was always inspiring to see how a family member was helped by a medical procedure. She was heartened as well by the care and attention her grandfather received during a battle with cancer. He passed away in June.